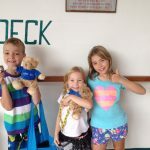 Planning a cruise with your family and thinking about whether or not ‘The Edge’ activities passes are worth the additional expense? 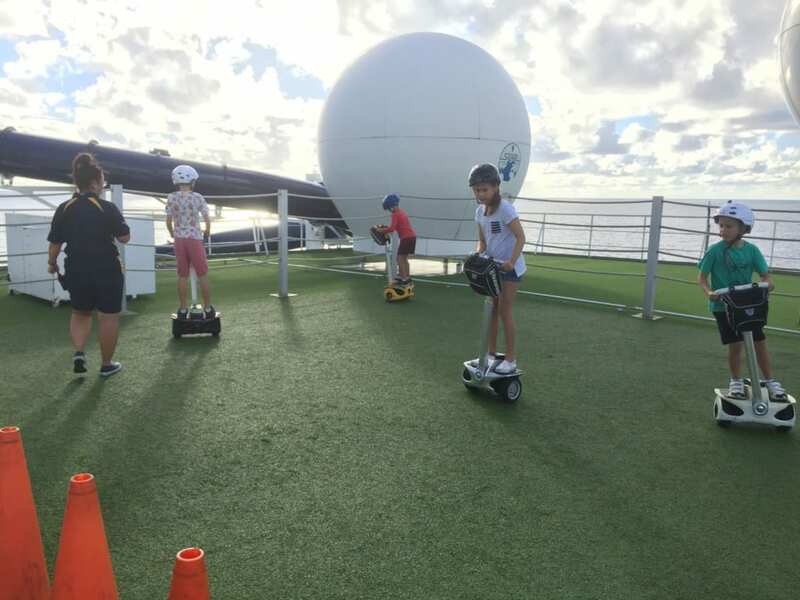 We’ve been on P&O Cruises Pacific Dawn’s ‘The Edge’ activities three times now and can hand on heart give you an honest review – read on! Let me put your mind at rest, right upfront. All the activities are completely safe. The instructors are fully trained and experienced and closely supervised. They also closely supervise your kids at all times. 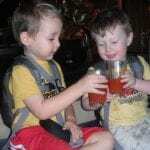 As a parent, I felt comfortable that they had saftey as their main priority. 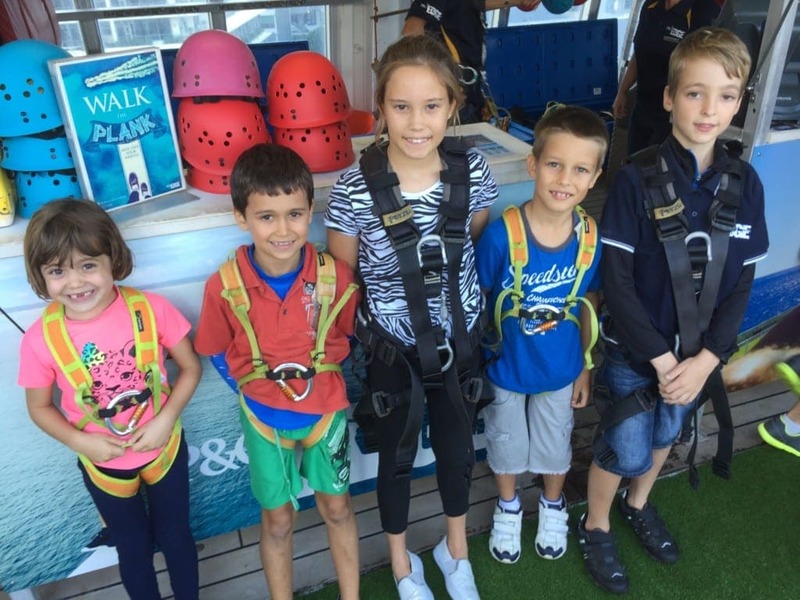 Whilst, like most parents, I am always looking out for my kids and ensuring that they dont seriously damage themselves, what I like most about The Edge activities is that our children get to take risks!! Remember those from YOUR childhood – RISKS? How many parents have you heard say that they feel that ‘children today’ are being wrapped in ‘cotton wool’ and not allowed to take risks… cartwheels and handstands are being banned at schools, children are not being allowed to climb trees, bike riding is on the decline! Our recent article ‘True Grit – Building Capacity Not Dependency’ suggests ‘Good parenting, like good education, provides for a caring, ‘secure base’ and a ‘safe haven’ from which children can grow; as well as opportunities that may mean facing risks and disappointments.’ Therefore within the boundaries of a safe environment, The Edge gives our kids the opportunity to take risks, with direct supervision. I love this… and so do the kids! I asked Master 10 to explain what The Edge is like. These are all his words below – after all, who is better to tell kids about these activities than another kid! 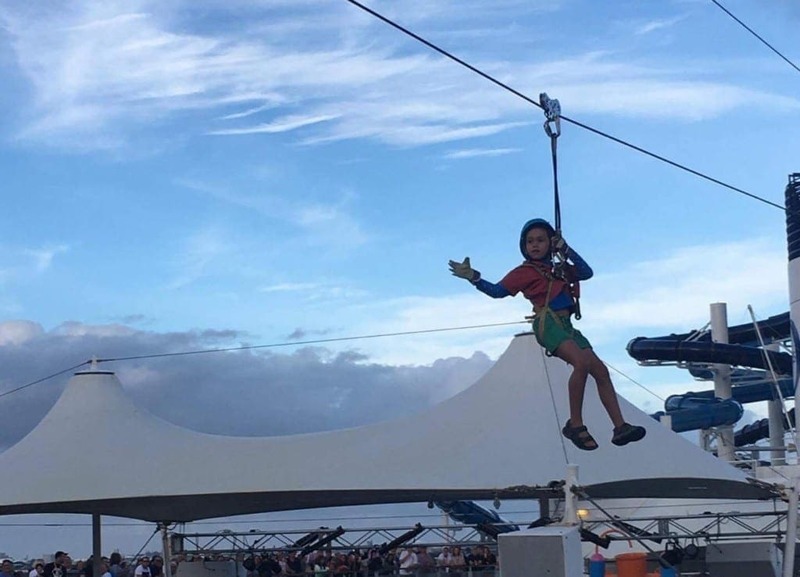 P&O’s The Edge is the onboard adrenalin park with exciting activities that are suitable for children aged 6 years old and above. 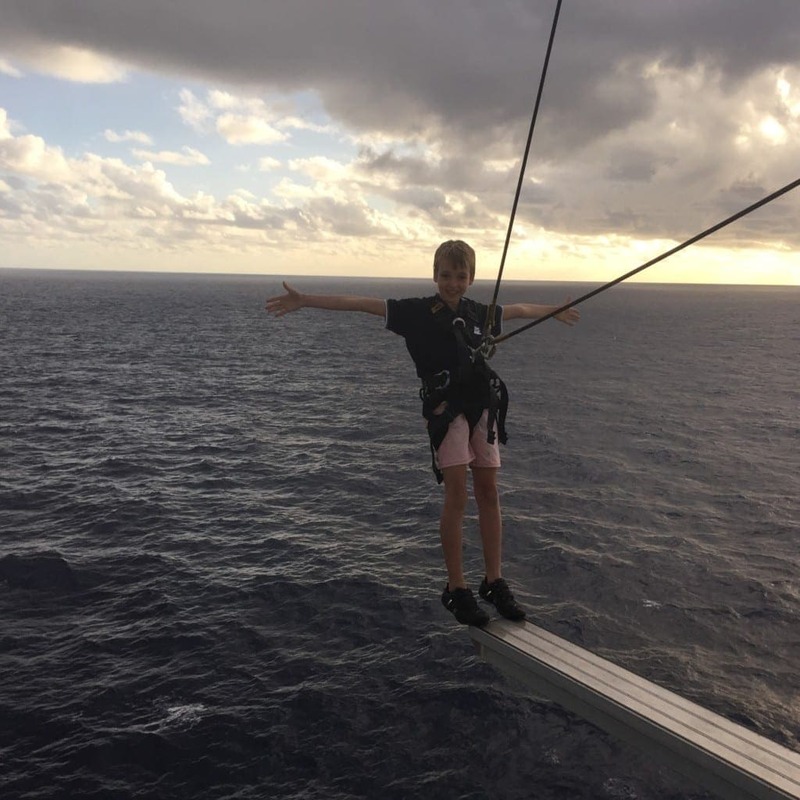 Depending on which ship you are on there are a range of options – on the Pacific Dawn there are 18 different activities for thrill seeking kids (and their grown ups!). 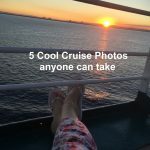 We’ve reviewed all the ones that we tested over the last 2 years/3 cruises. 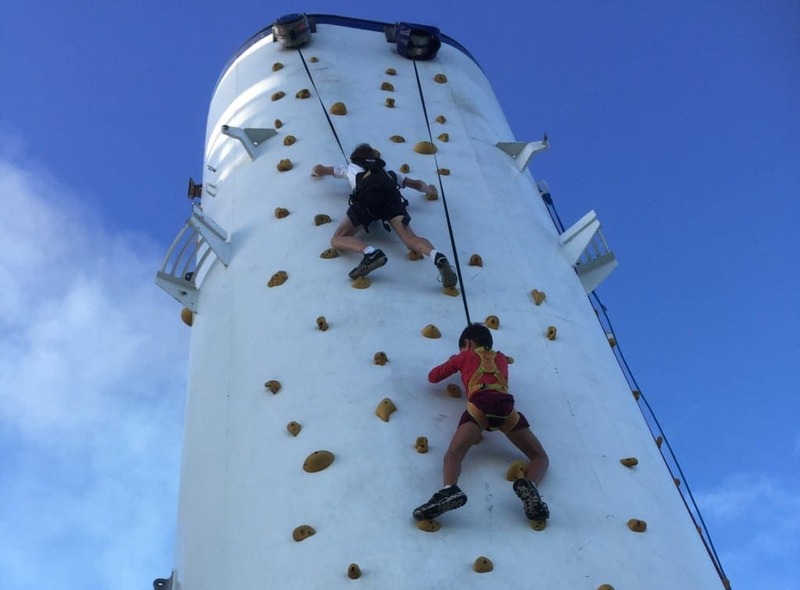 On the climbing wall you will be climbing to the top of the Pacific Dawn’s aft funnel. There is an ‘easy’ side and a harder side and the instructors are great at letting you know which is which. If you are a ‘first-timer’ you can start on the easy side until you get the hang of it. They have automatic belays so if you slip you are completely safe, they just lower you slowly to the ground… you can’t fall! The flying fox is REALLY fun and one of the first things you should go on. It is the fastest way to get from the aft to the forward of the ship (that is the back to the front). 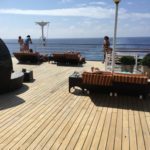 Once up there you will feel really high, but you are completely safe and you will see the best views – when in port you will see what’s going on on the land and while at sea you will see all the things people are doing on the ship. You should definitely do this at the ‘Sail Away’ party. Everyone watches you and you might end up on the ship’s ‘big screen’- so much fun! What did I do on the Pacific Dawn’s Edge? Oh you know… just hung aroung! This is another great activity that we have done three or four times now. You get to take over ‘The Dome’ on Deck 14 and hunt down the other players. My cousin and I really enjoyed being on opposite teams… and I won! 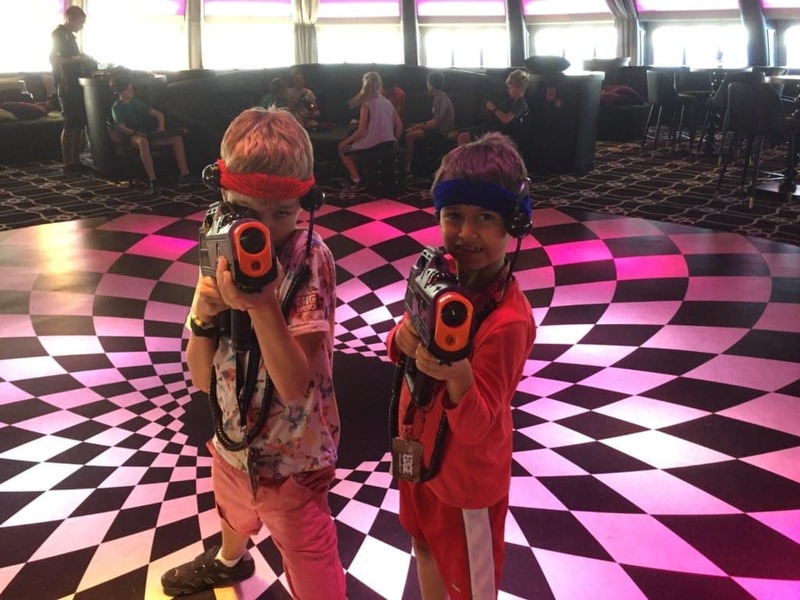 Laser Tag is a great fun game for everyone… well except my 6 year old cousin because she said the guns were too heavy for her to carry! This was the first time we went on the segways. I’d never been on one before, even at home, so it was really weird to begin with. Once we got the hang of it we got to ride them around obstacle courses on the very top deck. SO. MUCH. FUN. You can see the instructor in this photo making sure we are all ok and having a great time! This one looks really scary, but I promise you, it isnt really. My mum said she really struggled to watch me do this one, but I wasn’t scared at all. It’s because the harness keeps you really safe. You are all clipped in, then you just go out for a walk holding on to the rope and turn around and lean out… easy! So these are the ones that we have tried so far… there are some more that we will definitely try next time…. hey Mum, when is our next cruise? How much are P&O Edge passes? 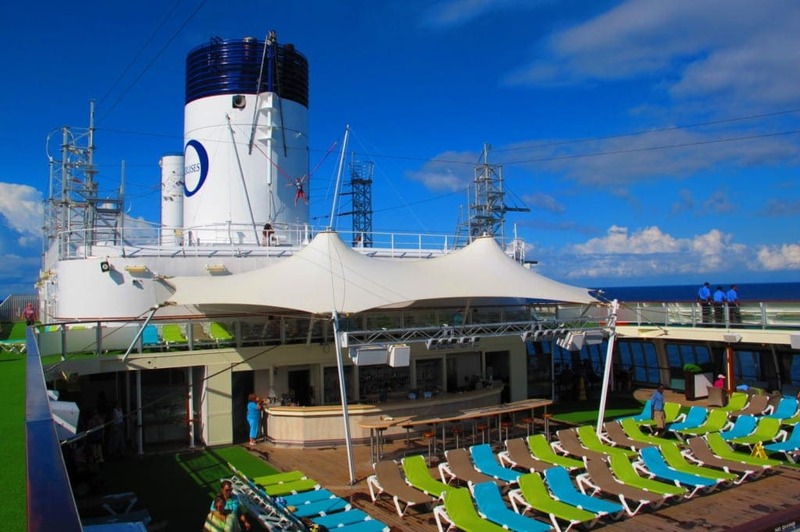 Find your perfect P&O Cruise here.